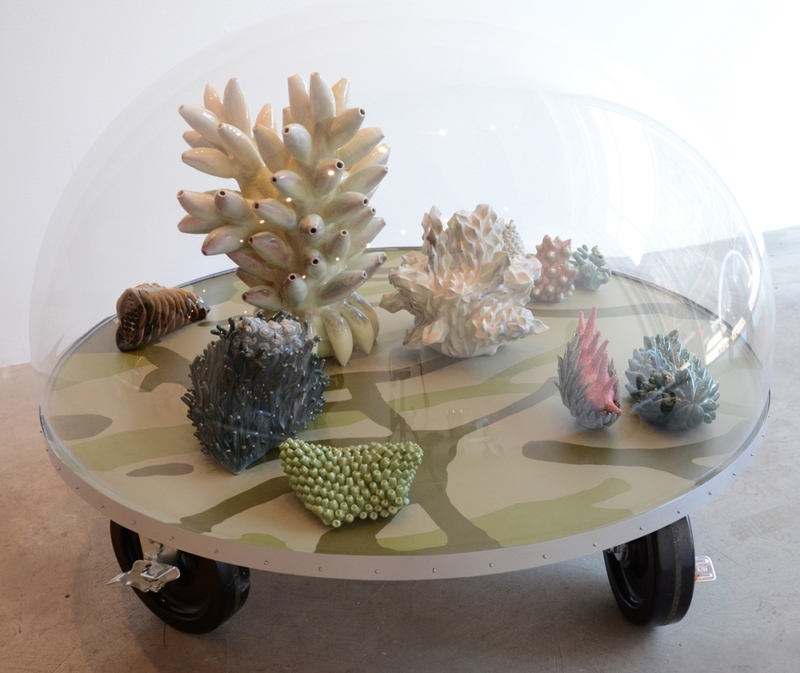 Installation view: Chris Garofalo: Zoophytosphere Vivaria, Rhona Hoffman Gallery. February 2 - March 9, 2013. Rhona Hoffman Gallery is pleased to present Chris Garofalo’s Zoophytosphere Vivaria. 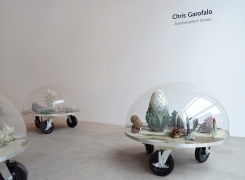 This will be Garofalo’s fourth solo exhibition at the gallery. 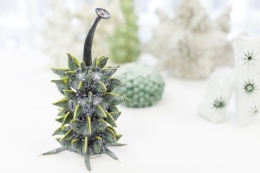 Chris Garofalo’s Zoophytosphere Vivaria will feature her porcelain sculptures that emulate the genetic make-up of flora, fauna and aquatic life. 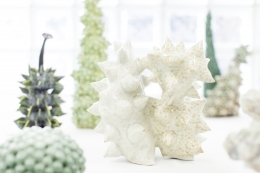 Exquisite multiple glazes achieve the convincing skins and coverings that decorate these delicate subjects. 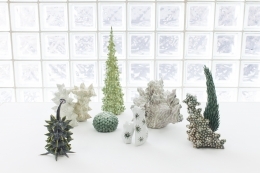 Situated in a unique kingdom between animal and plant, Garofalo’s hybrid forms appear simultaneously prehistoric and futuristic. 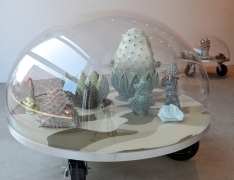 The collection of works on view in Zoophytosphere Vivaria is housed in custom-made dome structures, used for exhibition purposes only, that reference the environmental concepts of both biomes and vivariums. While biomes classify the earth’s major ecological communities, a vivarium simulates an ecosystem on a micro level as an enclosed area built for keeping animals or plants for observation or research. 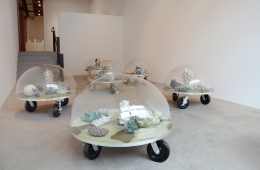 The "camouflage" bases on which the works sit illustrate various biomes, while the reflection on each dome surface helps to disguise the tender subjects. 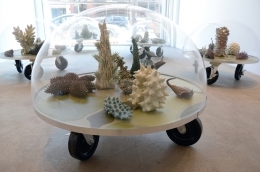 This combination compliments Garofalo’s desire for the pieces to “look like they grew or made themselves.” Through these carefully cultivated mini biospheres, Garofalo seeks to remind the viewer that we humans present both the greatest threat to the diversity of life forms on Earth and the greatest hope for its preservation. 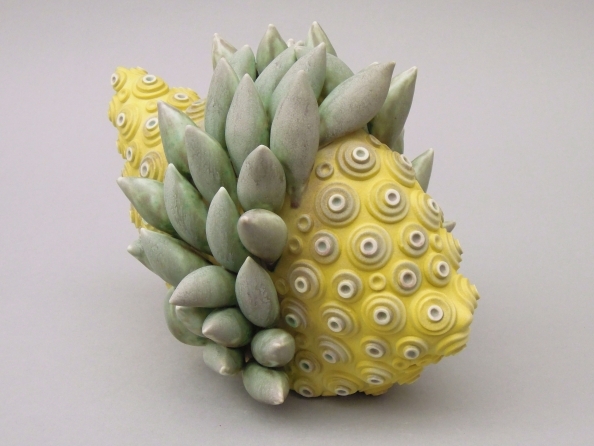 Chris Garofalo worked in printmaking and graphic design before discovering her passion for sculpture. A native of Illinois, she has lived in Chicago since 1980. She has been exhibiting her sculptures since 1991, including a highly acclaimed installation at the Garfield Park Conservatory in 2005, inclusion in the exhibition La Carte d’Après Nature curated by Thomas Demand at Matthew Marks Gallery, New York, and recent solo exhibitions at the Muskegon Museum of Art, in Michigan and Hyde Park Art Center, Chicago, Illinois. In 2007 she received the Joan Mitchell Foundation Painter and Sculptor Grant Award.